1) Actual differences in efficacy due to differences in pharmacokinetics, and -dynamics. 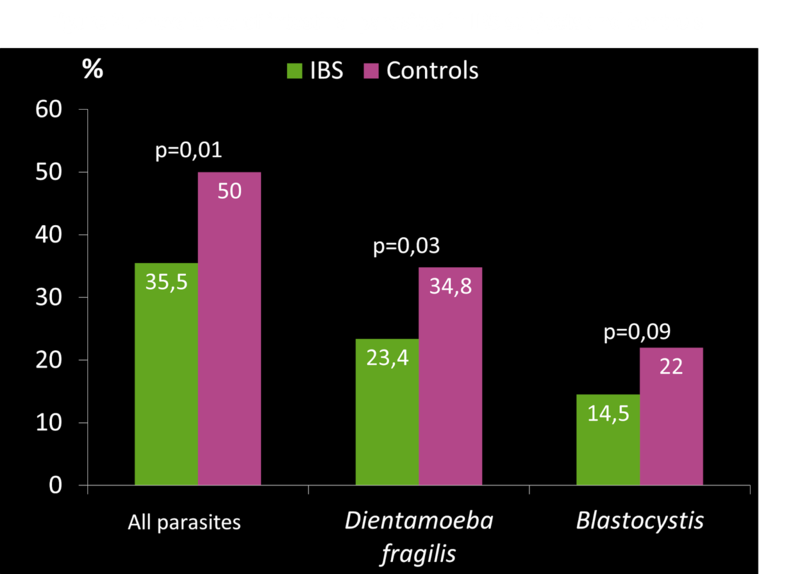 Some drugs used for treatment of intestinal parasites are absorbed quickly from the intestine, while others are practically not absorbed at all (but stay in the intestinal lumen). For instance: Metronidazole is absorbed almost 100% in the proximal part of the intestine and may very well fail to reach Blastocystis, which resides is in the large intestine. 2) Different methods are used for evaluating treatment efficacy. If insensitive methods are used, the efficacy of any drug will be overestimated. Culture in combination with PCR is clearly advantageous in terms of evaluating microbiological efficacy since it will detect viable cells (see previous blog posts). 3) Drugs used in Blastocystis treatment may have broad spectrum antibiotic activity (e.g. metronidazole) and thus affect the surrounding microbiota, which again may influence the ability of Blastocystis to continue establishment. Hence indirect drug actions may play a role too. Could vegetables contribute to Blastocystis transmission? 4) Diet. What types of food do we eat? I notice that some people undergoing treatment for “blastocystosis” are cautious about eating carbs, for instance, and turn to vegetables only or at least non-carb diets, thinking that by cutting out carbs, they will cut off the "power supply" to Blastocystis. I’m not sure that this approach is very effective and it’s also important to acknowledge that the processing and metabolism of the foods that we ingest are complex. I hope to be able to do a blog post once on short-chain fatty acids, for instance. Again, changes in our diets may influence our bacterial flora which again may have an impact on Blastocystis. Importantly, we don’t know much about potential transmission of Blastocystis from raw vegetables and whether this could be a potential source infection (vegetables contaminated with Blastocystis). 5) Which leads to the next issue: The issue of re-infection. With so many people infected by Blastocystis (probably between 1-2 b people) it is likely that many of us are often exposed to the parasite. If we receive treatment but are not cut off from the source of infection, microbiological and clinical cure will be short-lived if at all possible. 6) Compliance - some drugs have serious adverse effects, and so, failure to reach microbiological cure may stem from failure to comply with drug prescriptions. 7) Differences in drug susceptibility. 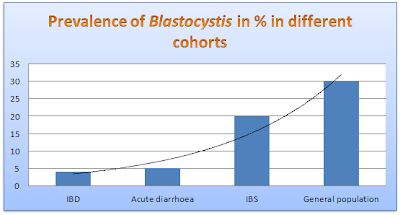 There is evidence from in vitro studies that Blastocystis subtypes exhibit differences in drug susceptibility. In the absence of sound data that take all of the above factors into account, it is not possible for me (or anyone) to predict exactly which drug (combo) that will work and which will not. I think that it is important that GPs or specialists who take an interest in treating Blastocystis collaborate with diagnostic labs that are experts on Blastocystis diagnostics. If any drug or drug combo enabling microbiological cure can be identified, such pilot data can be used to design randomised controlled treatment studies that again will assist us in identifying whether Blastocystis eradication leads to clinical improvement. I will try and provide some thougths on other future directions for Blastocystis research soon. Stay tuned! A reader of this blog asked me about the nutritional requirements of Blastocystis and whether I thought the parasite can be eradicated by fasting. Given my background (I'm not a dietitian for starters), I guess my best way of approaching this is by drawing on my experience from the lab. When we diagnose Blastocystis, we have multiple methods to choose from, some of which are better than others (please look up previous posts here for more information). Short term (i.e. 24-48 h) in-vitro culture at 37 °C in Jones' medium is almost as sensitive as PCR (molecular detection). This means that if viable Blastocystis is present in a faecal sample, then it will most probably "come up" in culture, which means that in a day or two, we will be able to detect those "characteristically non-characteristic" soap bubble structures (the vacuolar stage) by light microscopy of a small portion of the culture - they will be all over the place! So, what's Jones' medium? Well, Blastocystis can be cultured in a variety of different media, some of which are very primitive. Jones' medium is probably one of the simplest media, and consists mainly of electrolytes, yeast extract (contains nucleic acids) and horse serum (containing lipids). Importantly, we don't even have to add starch to the medium, when we culture Blastocystis xenically (i.e. under non-sterile conditions and this is what we always do when using culture diagnostically). Blastocystis has also been grown in a saline-serum medium, again in the presence of bacteria. Apart from providing the anaerobic environment required for Blastocystis to thrive, bacteria most probably constitute a significant source of nutrients for the parasite. We can consistently keep strains of Blastocystis in xenic culture for weeks, months, years, observing vigorous growth, and it is clear that the bacteria and the simple medium supply nutrients in abundance. I have never managed to axenise (i.e. eliminate bacteria from) a culture, but others have been successful at times. One of the pioneers in Blastocystis research, Charles H. Zierdt, noted that the axenisation of Blastocystis usually takes weeks/months with a continuous reduction of bacterial numbers and species, until one species, usually a Bacteroides sp., remains; elmination of the last bacterial species may or may not result in axenisation, simply depending on the need for bacterial support. One of our future goals is to characterise the bacterial flora in individuals with and without Blastocystis. I believe that even during fasting, Blastocystis will have plenty of access to essential nutritional components. It is possible that fasting may impact the intestinal bacterial flora, and if Blastocystis is dependent on a certain bacterial flora, it may be so that the parasite can be "manipulated" by manipulating the intestinal flora.